This yearbook celebrates the Third Culture Kid and their nomatic life style. According to the Editor, Samyaka Verma, "GMC's student population is a map of the world from where they are from, where they've been and where they are going." Samyaka created Suzie, a character with hair exploding from her head in all directions and styles. 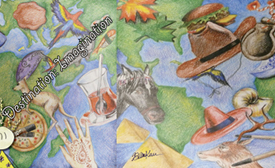 You can follow Suzie as she travels through this imaginative yearbook. Kudos to yearbook staff, Terence Douglas, Samyaka Verma, Kevin Celik, Michael Zachau Walker, Maighdlin Doyle and Melis Ozaltin. Many thanks to faculty advisor, Terence Douglas, who allowed us access to the entire yearbook online for a limited time. This made our job much easier and gave us access to high quality artwork with which to work. We work closely with the AnkaraHighSchoolConnection.net web site. They are a high school web site that encourages registrations from those who actually attended the high school in Ankara, although they occasionally accept students who attended middle school. For this reason, we have omitted Kindergarten through 6th grade.